The migration routes of the Lenape epic are shown in yellow. The timeline is shown by blue numbers overlaid on the route. The continuing Lenape epic began in Greenland 985. The areas on Carte Du Canada labeled “Les Christian,” “Asslenipoils,” “Ilinois,” and “Pennsylvania” show the size of the Lenape nation in 1703. At least twenty four (24) modern tribes, who lived along the route have Lenape ancestors. The area occupied by the tribes, who descended from the Lenape, ranges from the Atlantic coast to the “purple mountain majesties;" from Fort Nelson, Manitoba, Canada to Savannah, Georgia. 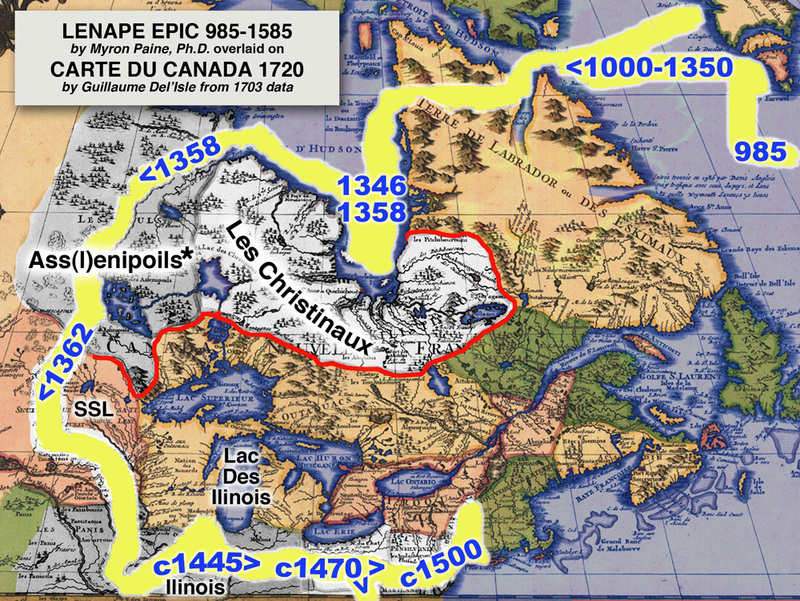 The Carte Du Canada (Carte) reveals the unsuspected Lenape epic. The Carte confirms that the largest area of “Les Christinaux” was in the northern forests of North America surrounding James Bay and the land south of Hudson Bay. This area was the termination of the migration across ice recorded in Maalan Aarum (MA) Chap. 3. On the Carte the large white area from Fort Nelson in the west to the Eastmain River on the east side of James Bay is labeled “Les Christinaux.” This is French spelling for the sounds the Jesuits and French voyagers were hearing. The words are not for Jesuits converts because the French would have used the spelling “Chrétien” for them. To the Jesuits and French voyages the name “Christinaux” meant as much as the name “Ojibwa,” no more and no less. But “Christinaux” is French spelling for an Old North word “Kristen,” which means “Christian,” and a Gallic word “slough” which means “multitudes.” The Americans included a large number of Irish and Scottish people, who called themselves “Albans.” The Albans and the Ojibwa were also people, who abided with the pure. in two instances the "l" appears in the name, in this position it does not. In 1940-56 Reider T. Sherwin wrote eight volumes of The Viking and the Red Man, books that have over 15,000 comparisons between the Lenape language and Old Norse. Sherwin accumulated more than 40,000 Lenape words. A very important result is that Sherwin’s comparisons show that the Lenape syllables “Len,” “Lin,” “Ren,” or “Rin” can only mean “pure” if they are found anywhere in any Lenape word. Sherwin’s comparisons can also decipher most other Lenape syllables. So, a researcher can look at (better listen to) the syllables in a Maalan Aarum stanza to determine if they pass the Drottkvaett format, an oral format to let the listener know if what he hears is the same as what was said miles away and months ago. Then a researcher can refer to Sherwin’s comparisons to determine the meaning of each syllable. The 1350 stanza maker clarified what “Len” meant. In MA 3:7 he describes a Bishop, who was “immersed to be “Len.” People, who were “Len,” lived by the ethics of Christ. Lenape tribes with the word “Len” in their name lived the ethics of Christ. The Carte shows that most of the people, who lived north of the Great Lakes, were either “Len” or “Christinaux” people. Around the Great Lakes the Ojibwa, which means “Greatest” preferred to stress “Great” instead of “Les,” but they and the Albans called the sun “Jesus” also. The next stage of the Lenape migration south of Big Stone Lake is not well defined on the Carte. The Maalan Aarum has stanzas that correspond to known circumstances, ancient names left on maps, and topographical features. 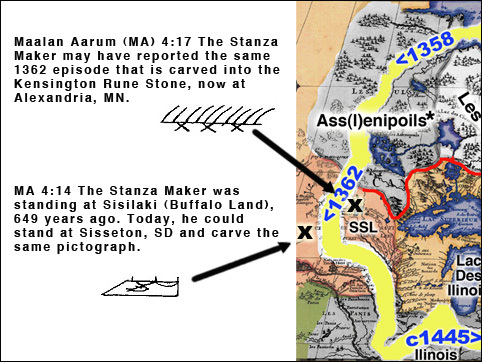 In MA 4:14 the stanza maker was standing in Sisselaki (Buffalo land) “looking east to fish country, toward the [Great] Lakes.” Near Big Stone Lake on the border between South Dakota and Minnesota there is a town called “Sisseton” The “Sissel/Sisse” syllables appear to imply that the original meaning was “Buffalo”. A stanza maker standing in Sisseton, SD today would be able to make the same sketch and stanza. The wording of MA 4:17, which is about ten dead men, appears to be duplicate recording of the episode punched into the Kensington Rune Stone, which is now on display in a museum in Alexandria MN. The killing of ten men at once might have been a shocking episode for the Lenape. Their ethics may have included the Ten Commandments, which includes “Do not kill [humans].” The episode yields a firm calendar date, 1362, for the MA 4:17 stanza. So the date on the Kensington Rune Stone, 1362, and the location from the Maalan Aarum, near Sisseton, SD, are known references to an area on the route of the Lenape Epic. The Maalan Aarum stanzas indicate that, during the following generations, the Lenape moved south to “corn land.” The Big Sioux River starts close to Sisseton and flows relatively straight south into the corn county of South Dakota. This may have been the route taken by the Lenape. A string of Lenape names remain beside the Big Sioux River. One small town today has the name of Veblen. If that name stayed in place for 600 years, while people came and went, a Lenape-Old Norse speaker would know the town’s people wanted “only pure” visitors. Sioux Falls SD is located in Minnehaha County. Minnehaha is a Lenape name meaning, “Little [water] falls.” Palisade Park near Sioux Falls features a little water fall, which is a rarity on the Great Plains. Some time after the Lenape migrated into the Minnehaha area they appear to have suffered a severe drought. They migrated straight east to two large caves (now Niagara and Mystery) in southeast Minnesota. Interstate 29 runs east-west between the Minnehaha county and the caves. There are Lenape names for streams, lakes, and towns along the route. After the drought the Maalan Aarum describes the Lenape’s slow migration toward the south along the west bank of the Mississippi to the Missouri River. Jesuits of the early1600s recorded that there were Illinois tribes in Iowa and Missouri on the west bank of the Mississippi River. 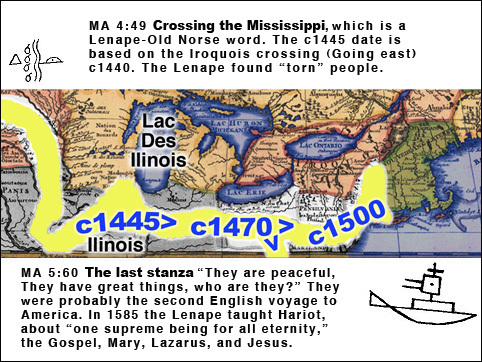 Then about 1445 the Lenape crossed the Mississippi. They were going east. The name “LES ILINOIS” appears along the bottom of the Carte. The “Lin” syllable is another spelling of “Len.” “Les Ilinois” occupies the area eastward from the Mississippi River to Lake Erie. The lake now called “Lake Michigan” was labeled “Lac Du Ilinois” by the French. Again the Maalan Aarum describes another migration of the Lenape who called themselves, at this stage, the “Illini,” after they crossed the Mississippi. The great Ilinois confederation on the Carte occupied what are now the states of Illinois, Indiana, and most of Ohio. Some generations later, maybe about 1470, the Illini divided into the Lenape and the Shawnee (Southern Lenape) tribes. The Shawnee tribes went south off the Carte. The Lenape continued east to the Atlantic coast. The Lenape made a treaty with William Penn in 1682. They were still living in peace with the Quakers when the Carte was made. The Lenape name is not seen in the area of the English states. More than half of the land shown by the Carte was occupied by “Les Christians,” “Asslenipoils,” the “Ilinois,” or Lenape in Pennsylvania. All those people had Lenape ancestors. In the area shown on the Carte, “Geesiz, the light of the world” came up every morning and the teachers of the Lenape spirituality, the parents, taught the ethics of Jesus all day, every day.